Growing up, I saw a lot of frugal household tricks from my family and friends. Turn off the lights when you leave a room. Use plastic bags to line trash cans. Reuse paper grocery bags to cover textbooks. (That probably wouldn’t fly these days for iPads.) When it’s yellow, let it mellow…? Our parents made us do these things to save money. Then I grew up and realized these are some of the same steps my hippie friends are taking to save the environment. Was everyone in my little conservative hometown accidentally going green? Apparently, yeah. Many of the steps environmentalists suggest to reduce waste and use less energy have the delightful side effect of helping us save money. Win-win! In celebration of World Environment Day, here are 10 steps you can take this month to go green, reduce your carbon footprint and save money. Reducing your footprint is just one reason to live a minimalist lifestyle. In addition to the environmental impact of material consumption, there’s also the psychological impact of having all that stuff to keep track of. Not to mention the cost of buying and maintaining it! Here’s one more reason: You can earn a lot of money selling it (instead of sending it to a landfill). Our editor, Matt Wiley, and his then-fiancee were inspired by a podcast to cut back and clear the clutter from their life. That made Wiley take a long, hard look at the massive collection of DVDs and Blu-Rays gathering dust in a cabinet. He listed them with an app called Decluttr, which buys your old DVDs, Blu-Rays, CDs, video games and hardware like cell phones, tablets and game consoles. Decluttr offered Wiley $55 for 86 titles he was happy to unload. The company pays for shipping and resells your items for you, so you don’t have to deal with individual buyers. Plus, you can breathe easier with less clutter around — and get peace of mind entering a new marriage without that copy of “MacGruber” hanging around. Would you like to start investing… but don’t think you have enough money? Download the investment app Stash. It lets you start investing with as little as $5. And you don’t have to be a stock market genius to figure it out. Instead of picking and choosing what to invest in, you tell Stash what you care about. Whether it’s tech innovation or environmental issues, Stash will put your money into a portfolio that supports your causes. While you’re going virtual, consider opening an online bank account. Aspiration’s Summit checking account is totally free to use, and you’ll do all your banking online. This account yields up to 1% interest on your balance — that’s 100 times more than typical checking accounts! Plus, it reimburses your ATM fees and lets you make automatic donations to causes you care about. If you want to see your money grow even more, Aspiration’s Redwood Fund lets you invest in companies with sustainable and environmental practices, like battling climate change. You can open an account with the Redwood Fund with a minimum $100. Like all of Aspiration’s services, its fee is on a pay-what’s-fair model — you choose! If you want to keep your brick-and-mortar bank, you could save a ton of paper waste by not getting monthly bank statements through the mail. Do you really need that print out of every purchase? Most banks offer a paperless billing option — but some kind of legalese requires you to opt into it. If you’re still getting stacks of paper from the bank every month, call or go online to ask about getting those statements online instead. Thinking about opening a new account? You can do that online, too. These banks are offering bonuses for opening an account right now. Ever think about the amount of plastic you throw away from shaving? Few of us want to go back to the straight razor, but you can make a compromise. With a paid subscription to Dollar Shave Club, you’ll get up to five new blade cartridges each month. You get a fresh blade — no sharpening required! — and throw away a fraction of the plastic. Dollar Shave Club helps you be frugal, too. You’ll get your first month free (just pay $1 shipping). After that, your subscription is just a few bucks a month. While credit cards are criticized for their not-easy-to-recycle plastic, there are plenty of ways using one can help you go green. Credit cards make going paperless easy. You can view and pay your bills online, so no more wasted paper in the mail. Plus, a card typically lasts longer than paper money, so using plastic could help cut down on waste and paper consumption. Any Penny Hoarder knows credit cards help you save a ton of green, too! With a cash-back credit card, you can get paid for every dollar you spend. If you’re just dipping your toes in, we recommend checking out the Chase Freedom Unlimited card. Its claim to fame? You’ll earn an unlimited 1.5% cash back on all your purchases. Plus, if you spend $500 in your first three months of opening the card (hi, groceries), you’ll pocket a $150 bonus. Eric Hanson wanted a cleaner energy source, but didn’t have the option in his Maine home — and didn’t want to install pricy solar panels. So he went with renewable energy company Arcadia Power, which helps you offset your monthly energy consumption with 100% renewable sources. One of the simplest ways to go green is to turn off the lights. Cut your energy consumption and cost by turning off your electricity-sucking appliances, computers, TVs and lights. And beware of energy vampires — electronics and appliances that keep using power even when you’re not using them. The U.S. Department of Energy says they can add 10% to your electrical bill! For example, phone chargers keep sucking power even when you’re not charging, and a digital cable box can add more than $40 per year to your bill if you don’t unplug between uses. Instead, plug electronics into power strips that have an on/off button. That way you can easily cut the power to all the vampires by flipping a switch. You can save a ton of energy and up to 10% on heating and cooling costs for your home by properly adjusting your thermostat. Optimal summer temperatures are 85 degrees while you’re away and 78 when you’re at home. In the winter, aim for around 68 degrees when you’re home and 58 or less while you’re away or sleeping. Chilly — but frugal! A Nest thermostat will learn your habits, so it can automatically turn itself down while you’re away and adjust to your preferred temperatures. It costs about $290 upfront, but check with your utility provider to see if you can get a free or discounted unit. You’ve probably noticed occupancy sensors in office buildings or other businesses. This easy-to-install device costs less than $15. It cuts your energy waste by sensing whether a room is occupied and switching the lights off when it’s not. The Department of Energy claims an occupancy sensor can cut your wasted electricity for lighting by 30%. Once you install it, you can save energy — and money — without thinking about it! Being smart about how you wash your clothes will not only help them last longer — saving you money and saving the earth one spin cycle at a time — it’ll also reduce your energy consumption. Use cold water for everything — hot water requires a ton of energy. 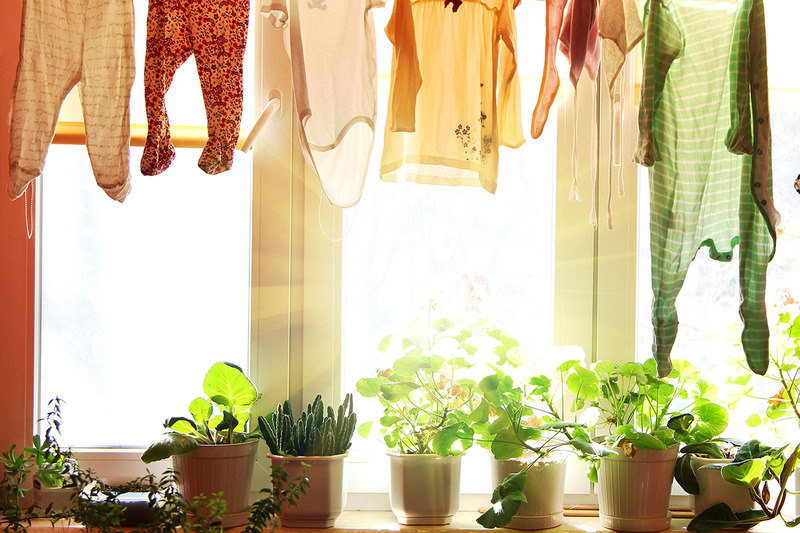 Dry your clothes on the line, or use a fold-out drying rack if you have a small apartment. Toss a clean, dry towel in with dryer loads to soak up water and require less time in the machine.